The biggest baseball set in the hobby is back and better than ever. Not only does 2004 Topps Total have Major League Baseball covered with 880 players (including 95 Rookie Cards), but each card also serves as a game piece. Now, there will be trading, set-building and game playing as the card back of every player features a color-coded game chart based on his statistics. 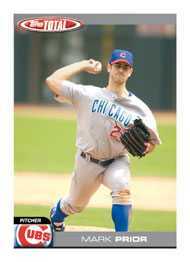 After choosing up teams, fans and collectors can match pitchers against batters for a fun, easy to play, baseball card game. (Instructions available in-pack and at www.topps.com). The biggest set in the hobby will also include a complete parallel (1 per pack), autographs and inserts such as "Total Topps", "Total Winners", "Total Production" and even unique 1 of 1 "Press Plates". And with a dual numbering system featured on each card, you can collect by way of the 880-card format or get involved in team-set building. "Team Stickers" and "Team Checklists" enhance the experience. 2004 Topps Total Baseball, which releases May 31, carries a kid-friendly $1.00 SRP for each 10-card pack.